Clipper are a company better known for their teas – indeed, the company is more properly called “Clipper Teas” – but they have a small range of both ground and instant coffee available too. 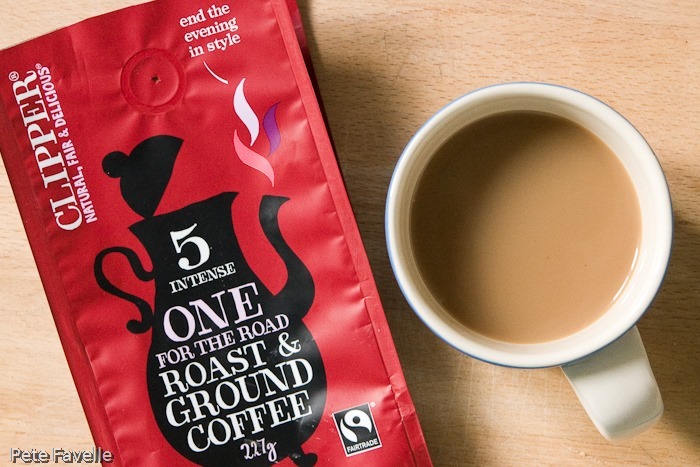 This is their One For The Road blend, a strong coffee from the Americas. It is, apparently, a coffee with which to “end the evening in style” but there is little else to be found – no tasting notes on the packet or even on their website, which seems a little surprising. The grounds have an appealing aroma – a strong roasted character, along with sharp lemon citrus notes and old polished wood. Brewed, the wood aromas are lost but the acidic citrus notes are more pronounced, along with just a hint of brown sugar. The taste, however, is lacking. There’s a slightly acidic bitterness but without any balancing sweetness and to be honest, very little in the way of actual flavour – it’s all bitterness and tannin without any richness or fruit to go with it. Overall, this is pretty disappointing stuff and doesn’t really deserve more than one star. As with all their coffees, this is Fairtrade, and is quite widely available in supermarkets.